Savannah is a town with something for everyone: History buff? Savannah is loaded with historic sites and stories. Are you a fan of art, music, and food? Savannah has numerous festivals, events, and entertainment venues to keep everyone intrigued and also all the best restaurants to satisfy the foodie in us all. Like to party? Savannah has a great night life and plenty of community wide events for letting your hair down. Want a great guys weekend? Savannah has sporting events such as golf, running, and baseball! How about a great girls weekend? Savannah is home to many fine spas and some wonderful shopping! The downtown district is known for unique items that cannot be found anywhere else. 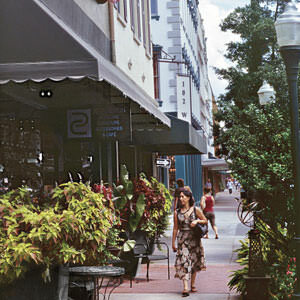 Take a look here to see some of the best shopping in downtown Savannah. “Brocante” means flea market. This shop features many new items as well as many salvaged items. You can find antique lighting, architectural fragments, Parisian fabrics, and Fauchon chocolate cubes in this two story bazaar. This is a shop owned by three young designers from Los Angeles, who fell in love with Savannah on vacation. They offer home furnishings, accessories such as purses, jewelry and a dessert and coffee bar! This is a great opportunity to bring your man– they offer both men’s and women’s fashions! This is a great place to find contemporary and eclectic home furnishings. They feature items made of silk, leather, and wood. This unique shop has a diverse selection of items such as jewelry from around the world, designer bags, African masks, and Cuban oil paintings. Zia is the owner and brings in styles and items from Kenya, Japan, and India, which are his heritage. This shop offers Asian antiques and home décor at affordable prices. This is a retail market with playful casual wear and colorful shoes. After Broughton Street, you may want to stroll over to historic and famous River Street! As you walk down the cobblestone road, you can find just about anything in the shops nestled in the old historic buildings. Do you like art work? Fashion accessories? The latest best-sellers? You can find it here, and all with a great view of the Savannah River! Now that you know where to shop on River Street and Broughton Street, meander over to the famous City Market, between these two streets. In the 1700’s, Savannah’s farmers and traders sold their wares here in this area in a squared arrangement, just like today. You can linger in the local gift shops, galleries and shops full of handmade goods. You may also want to rest by the fountain and watch the horse drawn carriages go by! This is also a great place to find entertainment, food, and some great photo ops! After a nice rest, you may be ready for some creativity! Check out the Design District along Whitaker Street and Jones Street to find vintage jewelry, art and antiques. This area is known for local boutiques selling unique and collectible items. Many shops feature things that were created by past and present students of Georgia’s Savannah College of Art and Design. So, as you see, shopping in downtown Savannah is a unique experience. You can find both mainstream items as well as unique finds and original designer wares that are sure to delight you, make a great gift, or start a good conversation! Part of the fun of making these purchases is the thrill of the hunt, mostly because Savannah is such a charming Southern city! Shopping in downtown Savannah is a destination in itself! You will want to spend at least a few days to not miss a single thing. As you make those plans, check out the bed and breakfast voted best of Savannah in the heart of the historic district– close to all this shopping, President’s Quarters Inn. They offer all the amenities that will end your day of shopping on a relaxing and restful note. Click here to check for current availability! For more information on fun activities in Savannah, Georgia, download our free vacation guide!